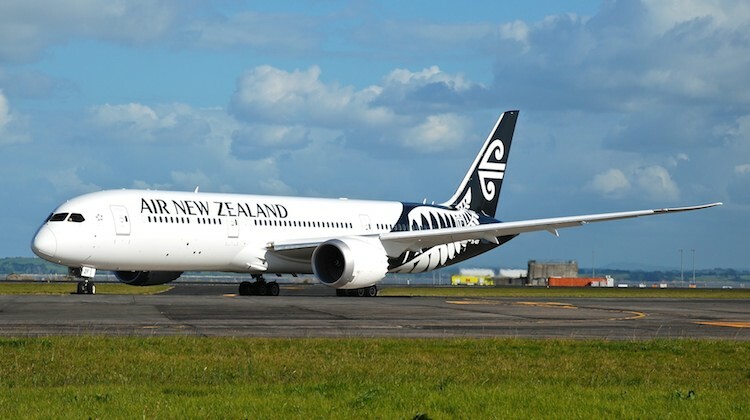 The incident occurred early on Sunday morning, February 10 2019, about five hours after ZK-NZQ took off from Auckland airport as the NZ289 bound for Shanghai. At that point, passengers were informed flight had to return to Auckland because the aircraft did not have the required approvals to operate into China. As this image from the AirportWebcams Twitter page showed, the ZK-NZQ was just west of New Caledonia when it reversed course and headed back to Auckland. One passenger on the flight, Eric Hundman, posted on his Twitter page that the airline apologised for the incident. The passengers were put up either at hotels or lounges in the airport while waiting for the airline to organise a replacement aircraft. They eventually took off to Shanghai for a second time on Sunday evening. The flight landed on Monday morning. An Air New Zealand spokesperson told The New Zealand Herald an administrative issue with ZK-NZQ meant the aircraft was not able to be flown to China. “It is normal process to get a flight plan cleared by local authorities prior to departure and this was done on this occasion and was approved by Chinese authorities,” Air New Zealand told the newspaper. Air New Zealand accepted delivery of ZK-NZQ in September 2018. The aircraft is powered by two Rolls-Royce Trent 1000 engines and is configured with 18 business, 21 premium economy and 263 economy class seats. The aircraft was acquired on lease Air Lease Corporation and is one of 13 787-9s in its fleet, which are used on services to the Americas, Asia, the South Pacific and across the Tasman. An image of ZK-NZQ from Jennifer Schuld’s Twitter page. The airline was due to repot its 2018/19 first half financial results on February 28 2019. It recently warned pre-tax profits would be lower than previously forecast due to softer travel growth and disruptions caused by mandatory engine inspections on its 787-9 fleet. It took 5 hours to get “just west of New Caledonia”? OOPS! That is one heck of an ”administrative error”…heads will roll in their ops. and flight planning departments. Certainly wont do AIR NZs image any favours. It’s aviation. Things happen as in every industry. I’m glad I wasn’t on it to catch a connecting flight! It seems like these days we need to leave a day earlier to make sure we get to our destination or connection in time. Pathetic show by ANZ!